This was a brightly coloured collection of threads together with dramatic pendant findings and lovely gemstones. My aim was to show different ways of using the findings to emphasise the versatility of the kit. 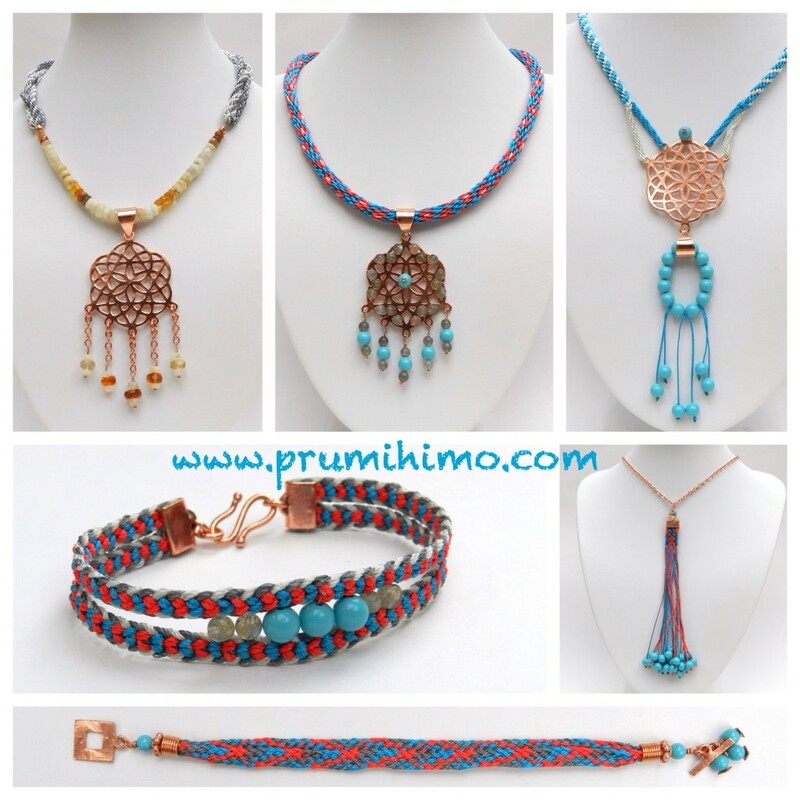 These designs can also be made with other beads and findings. The opals are graduated rondelles, the labradorite are 4mm rounds and the turqoise shell pearls are 6mm. However, the size of bead is not crucial in these designs so other shapes and sizes can be used. To watch the show, click here. 1. Thread a selection of opals onto beading wire/thread and create a 0.5cm loop at each end using crimps and crimp covers. 2. Embellish the pendant finding using chain and gemstones on headpins. 4. Make 2 more braids from the same loop. Make one with 6 x dark and 2 x light grey and the other with the colours reversed. Put the 2 cords in slots 32 and 16. Loosely plait the three braids and secure and seal the ends of the braid and use a fold over ribbon end. Add a clasp with a jumpring. A few more gemstones can be added in between the end and the clasp. 5. 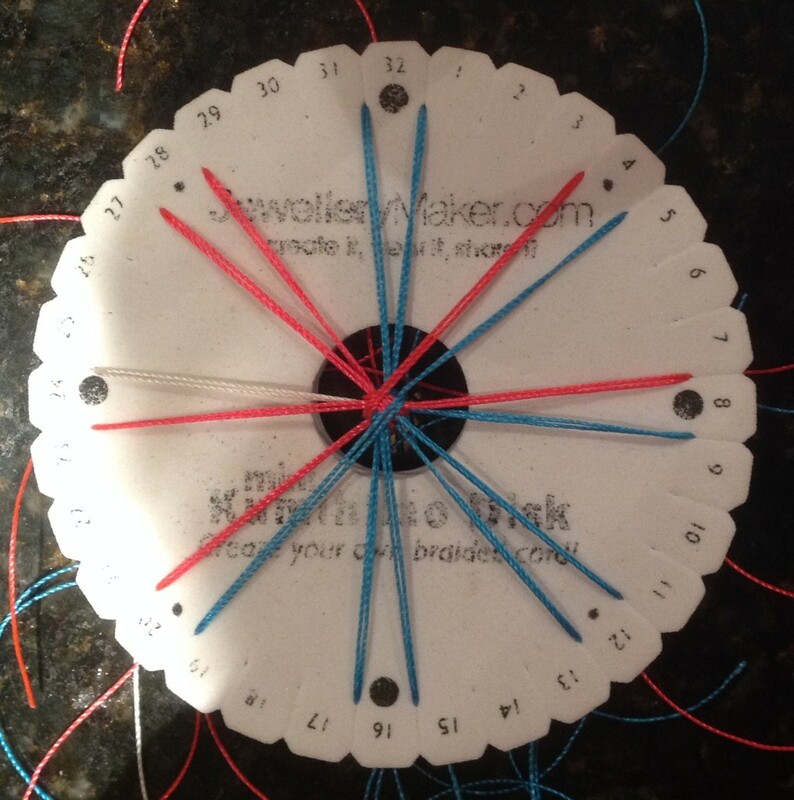 Slide the pendant onto the necklace and then repeat for the second side of the necklace. 1. Embellish the pendant finding with gemstones on headpins attached to the loops on the finding. Use either wire or monofilament to attach gemstones to the surface of the finding. 2. The braid is a 16 cord design with 2 strands of S-Lon in each slot. This is the set up. 3. Finish off one end of the braid with either a wired-on cone or a glue-in cap and add the clasp. Thread the pendant onto the braid before finishing off the other end of the braid. This is quite a straight forward design, so the only part which needs explanation is the joining of the two braids. You will need two disks for this process. 1. Cut 120cm x 4 turquoise S-Lon and thread it through one of the loops on the finding. Position the cords on the disk and braid in Round Braid for 2.5cm. Leave the braid on the disk and repeat using grey S-Lon through the next loop on the finding and a new disk. Move the grey cords at the east and west dots to double up with the cords on the north and south dots. Remove two turquoise cords from the disk and position them in one of the spare slots on the disk with the grey cords. Move all the turquoise cords across two by two. Once all the cords are on one disk tighten them all up and continue to braid. 1. Cut 1m x 4 coral, x 4 turquoise, x 4 light grey, x 4 dark grey. 4. Secure the ends of the braid, cut it in half and secure the new ends. Attach fold over ribbon ends and clasp. Sew the gemstones in between the braids. 1. Use the flat plate to make a 10 cord braid, or a 12 cord braid, as shown on the show. Use 70cm lengths of cord. 2. The braid will be longer than is needed for the bracelet. Seal the end of the braid with glue and app;y glue across the braid at the point where the length is correct for the bracelet. Spread the glue right along the spare length of braid and allow it to dry. 3. 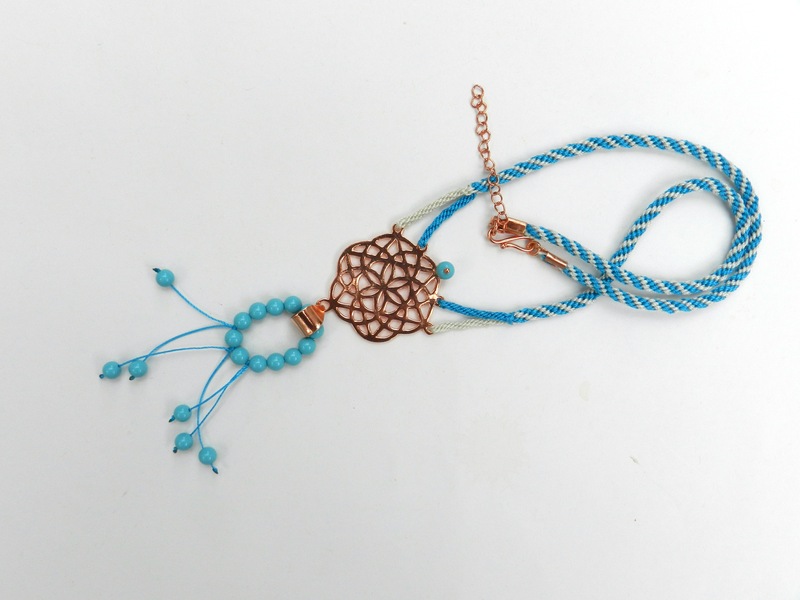 Cut through the glued braid and add ends and a clasp to make the bracelet. 4. Use the off cut of braid to make a pendant by attaching a fold over ribbon end. Thread a shell pearl onto each cord. Knot the cord, trim the excess cord and seal the knot with either glue or by melting it with a thread zapper.